Why are they famous again? (I'm just joking about the magazine- in case you took me seriously. Parker had just grabbed it from the table). The colored boards on the right with the larger pictures are called Choice Boards and are used during the boys Behavior Therapy sessions. The primary purpose of giving someone choices is to give them some control over certain situations. Both adults and kids like to have some control over their lives. It is more motivating to be able to decide which snack to have, which show to watch or what toy to play with. Providing choice is a positive strategy that may reduce some situational behavior problems. A choice board is a visual 2 or 3D exhibit of the choice possibilities. The choices may be expressed as pictures or text (2D) or can be represented by objects or tangible symbols (3D). Verbalizing choices often isn't effective with individuals with autism spectrum disorders. Greyson- Do you want to jump, go to the pool or play with the water table? Is too much. He may not listen to the whole message, he may not be paying attention until the second or third option is being listed, and the message may be quickly forgotten. With a visual display, Greyson has time to see all the possibilities, has time to think about the decision, and has time to check the options as often as he needs, before making a decision. At first when we begin to use the board each boy will only have a couple of pictures to choose from as to not overwhelm them. When we took Greyson out of school in March, we reevaluated everything we were doing for him. One thing we decided to implement was something called PECS- Picture Exchange Communication. 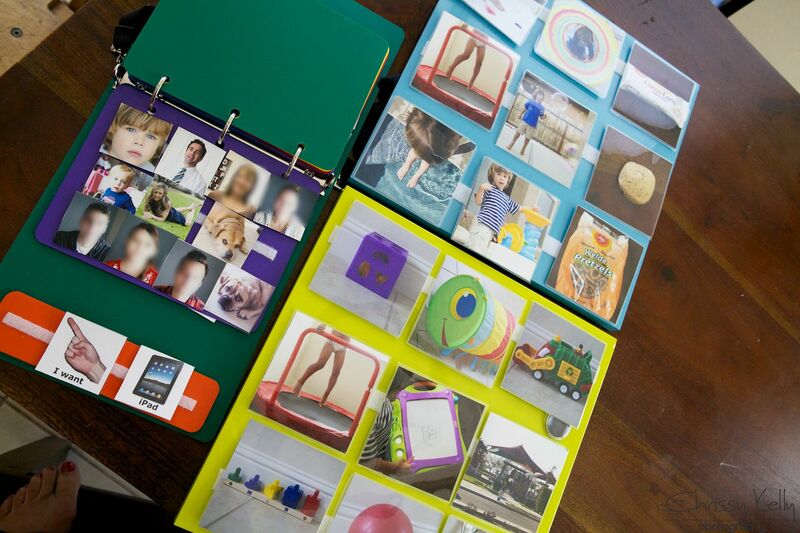 In the picture above it's the green binder on the left. We discussed it with his Speech Therapist and completely agreed with her recommendation that we put our communication efforts into teaching him to speak instead of teaching him to use pictures to speak. However since we are 2 years in and he still does not spontaneously initiate communication we are ready to try something new. And now on some days pretzel, jump and purple can sound very much the same- so pictures help to remove some of his frustration of being misunderstood. Many students using PECS end up developing speech. As we implement PECS- we will make sure that Greyson verbalizes any requests he makes using the pictures. 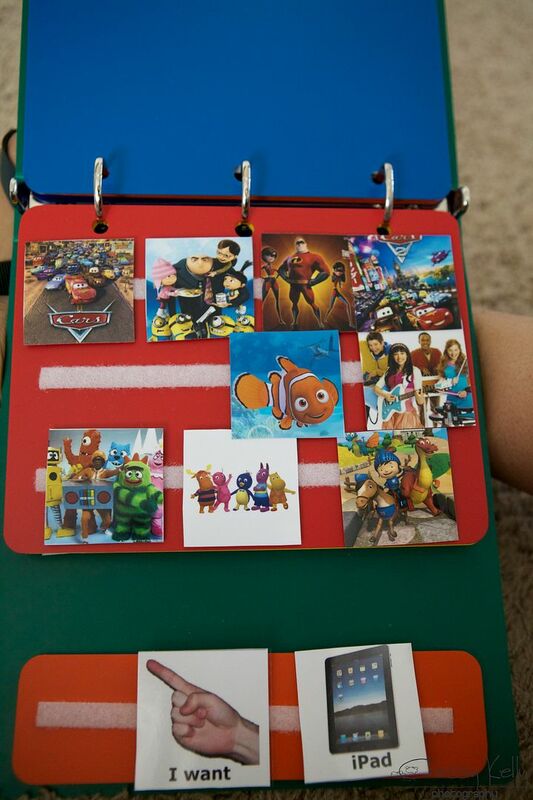 This page has all his favorite shows...a Special thank you to JB for printing and laminating and cutting out all of those little tiny damn pictures for the PECS book... We love you! That's it for now... thanks for stopping by.